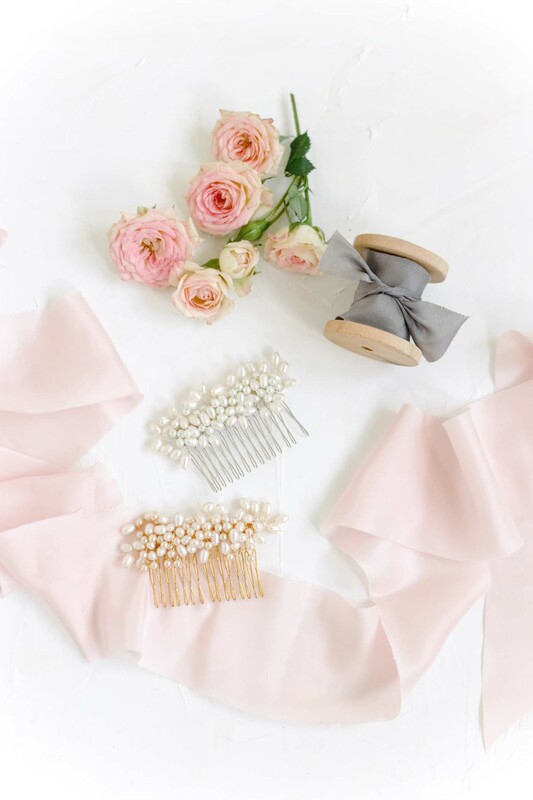 The Alyssum Pearl Hair Comb is the ultimate classic bridal hair comb. 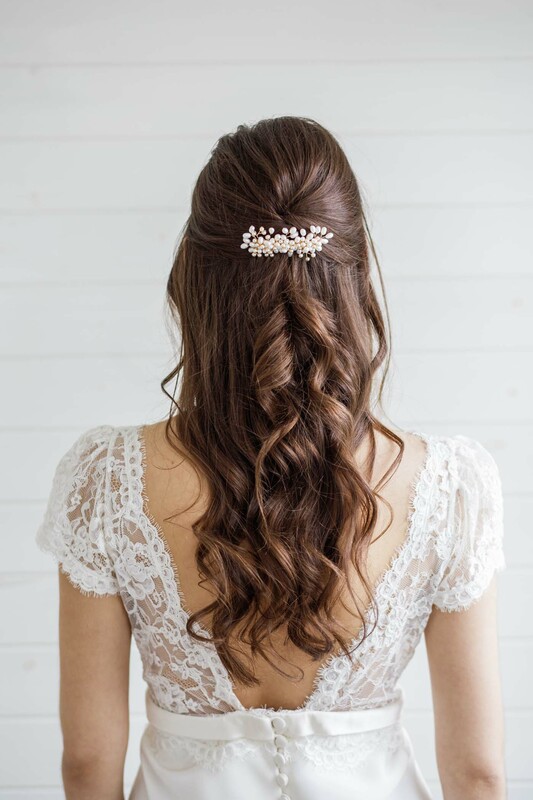 Set with dozens of freshwater pearls alongside gorgeous Swarovski pearls, this is the perfect finishing piece to any bridal hair do. Tuck it into a half up do, or into the side of a chignon, or slide it in above your veil. She suits them all! 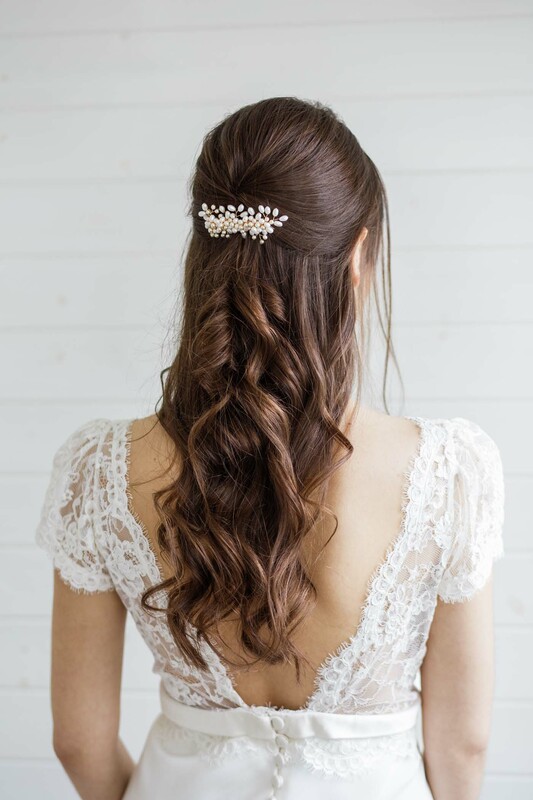 The Alyssum Pearl Bridal Hair Comb is available in gold or silver, and set on a beautiful wire comb, ready to slide into your chosen wedding hair style. Statement vintage style floral bridal cap set with handmade raw silk and silk chiffon cherry blossoms, nestled with vintage ivory velvet millinery leaves all set onto a large cap covered in raw silk and layers of soft tulle. Set on a narrow silver-plated headband wrapped in pale gold or brown ribbon for a comfortable and secure fit. Available in ivory or blush pink as pictured. A beautiful vintage style millinery influenced bridal cap headdress, echoing the styles worn in the 1920s and 1930s. This headpiece is set with delicate beaded lace set behind an embroidered ivory lace piece on the left side and a heavily beaded and sequined piece on the right side, further embellished with ivory velvet millinery leaves, for a gorgeous vintage style headdress that covers from ear to ear. The whole headdress is set on a thin silver-plated headband, wrapped in pale gold or brown ribbon for a comfortable and secure fit. 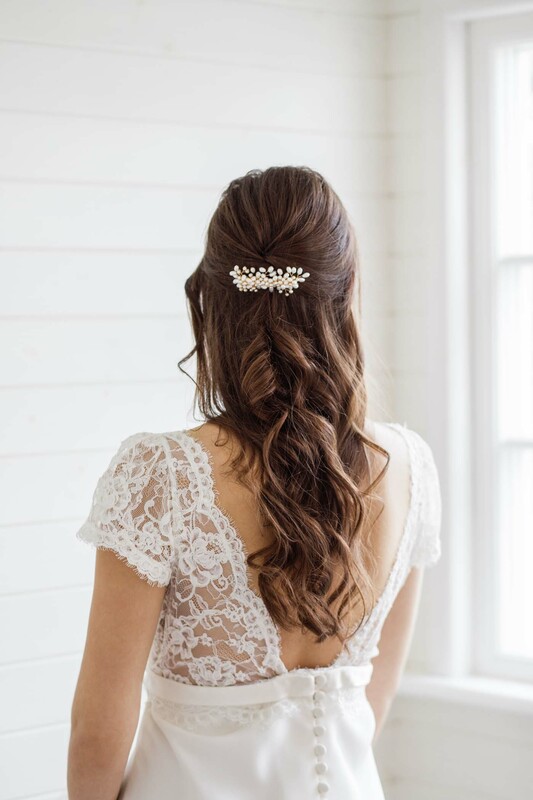 A perfectly beautiful gold bridal hair comb. Handmade with 16k gold plated five petal flowers alongside handmade enamelled leaves, gold plated vines and crystal teardrops in gold plated settings. This is such a pretty hair comb that would be equally perfect for a bride or a lucky bridesmaid. 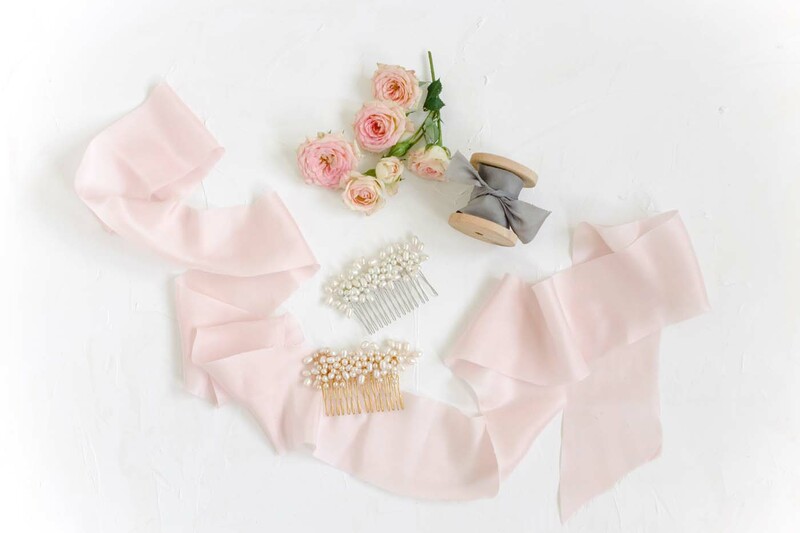 All of our handmade headpieces come beautifully packaged in layers of soft tissue paper before being gently placed in our gorgeous keepsake boxes. Beautiful vintage style lace bridal cap, echoing the vintage bridal caps and cloche hats worn in the 1920’s. Brought up to date with champagne lace and sprays of freshwater pearls, all set on a pale gold ribbon-wrapped headband. Also available in ivory lace.